Shop Audix DClamp Flexible Mini Gooseneck Mic Clip For Drums from AMS and enjoy Fast & Free Shipping. 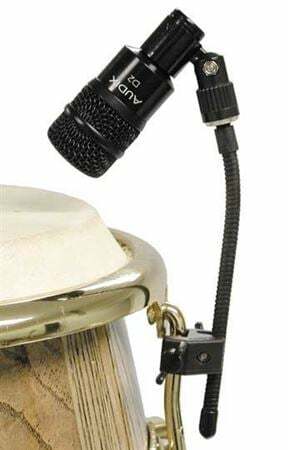 The Audix D-Clamp Drum Microphone Clamping System with Gooseneck is designed to attach to the tension rod of percussion instruments like congas and bongos. The D-Clamp features an extra long heavy-duty gooseneck for precise mic placement. With a low profile and a unique mounting system, the D-Clamp will attach to the lugs of most percussion instruments. Designed to be a sister product to the D-vice rim mount clip, the D-Clamp provides a benefit to both the player and the engineer. It's a low-profile mount that is very simple to use and allows precise positioning. Precision molded out of composite material, the D-Clamp will easily accommodate any 5/8 inch microphone clip. With the introduction of the D-Clamp, the percussionist's concerns about microphone positioning are eliminated. Audix has subjected the D-Clamp to some rigorous road testing and it is rock solid. With the low profile and low mass, it is extremely convenient for the drummers and sound engineers. They designed it to work with the D-series, the Micro-D, and it will also work with other microphones.